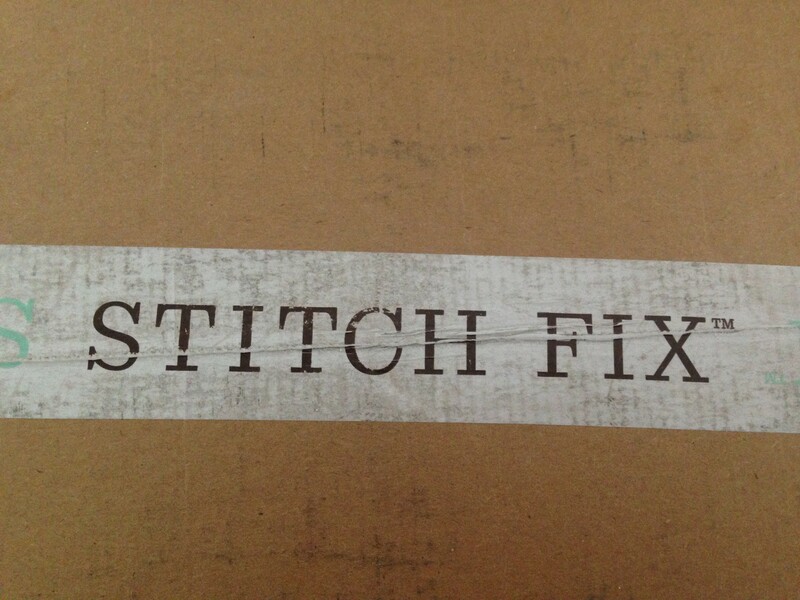 stitch fix | Apple pie, anyone? I did so very much think I was going to stop my Stitch Fixes for a wee bit… maybe until spring… but I forgot the first time and then the second time we were out of town when it arrived and I dunno what happened but I have 2 new bags and 7 new pieces of clothing. SERIOUSLY. It just keeps getting better and better, even with different stylists each time. It’s clear they are checking my responses and looking at the pinterest board I keep updated for styles and specific pieces I like. They make note of it in the quick letter they send and they are matching items up with previous pieces I’ve kept. Slick. 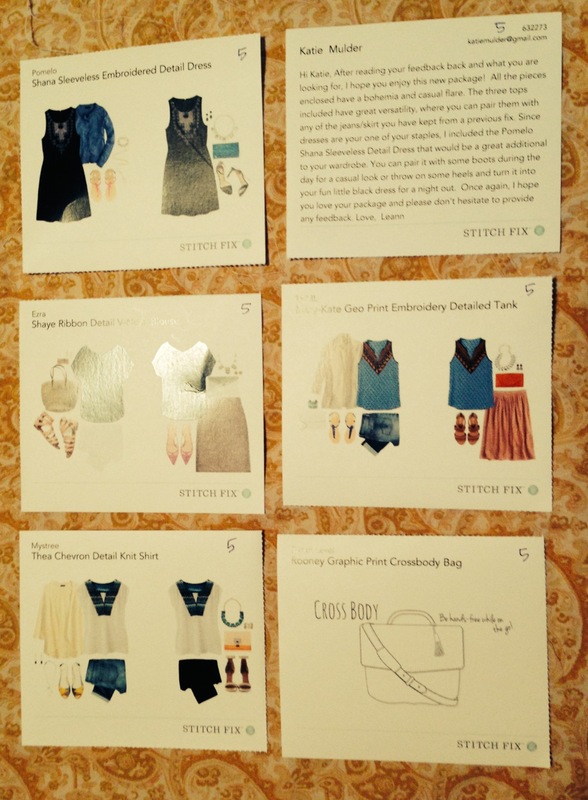 Stitch Fix is an online, at-home personal shopper. You fill out a detailed survey about styles and fit and preferences. You schedule a date. They mail you a beautifully wrapped box with 5 items, which can include jewelry, accessories like scarves and bags, shirts, pants, skirts, shorts, and jackets. You can also opt OUT of any of these items. I requested no jewelry and no outerwear, for example. You have 3 business days to try on the items in your box, checkout online, and return anything you’re not geeked about. They provide a paid envelope and all you do it drop it in the mail. If you keep all 5 items in your box, there’s a 25% discount on your total. Each box costs you $20, but that $20 is credited towards anything you decide to keep. So, as long as there’s one thing in the box you love, you’re not out any money. Saavy? After Fix #4, I asked for them to lean more bohemian and they listened. This was the first time I received a bag in one of my boxes. It was a nice change and I kept the purse since I was due for something smaller than a diaper bag. If you’ve seen me in the last month, you’ve seen me wearing this Mystree Thea Chevron shirt and carrying this Street Level Rooney bag. The cross body strap for the bag was immediately confiscated by my four-year-old, and I’ve not seen it since. I also kept this navy Pomelo Shana dress. SUCH A GREAT PHOTO. Sorry. The embroidery has pops of baby pink in it and the length was just right. Fabulous for summer church. Fix #6 sent me another bag, this time HUGE as opposed to “day-sized.” It will be a great carry on option or beach bag or Meijer Garden purse when I need to carry 400 snacks. I love it. 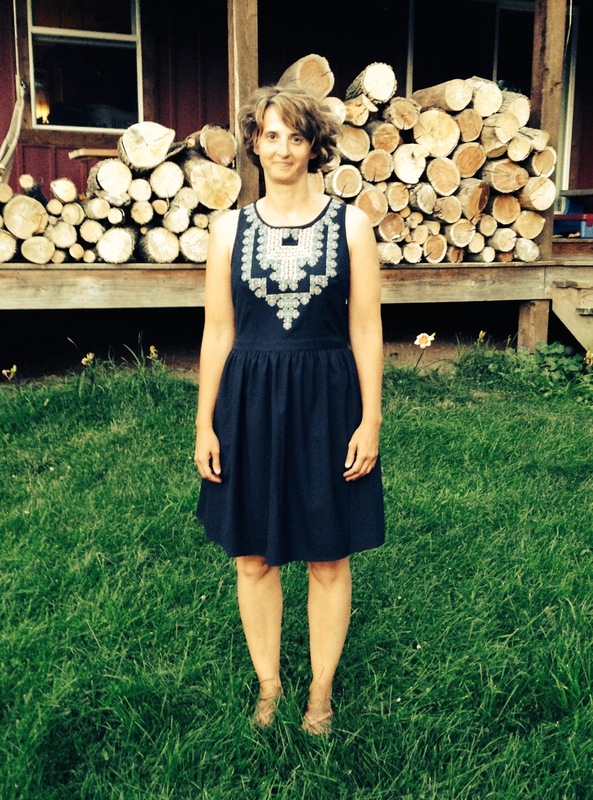 The Gilli Alenna dress is identical to a Garnett Hill dress I pinned a couple weeks ago. It’s super soft and double lined on the top… very nice quality and made in the USA. Abby and Rylie wanted in on these photo ops… I will not apologize for them. This is neither a fashion nor photo blog and their subject tends to talk a lot. 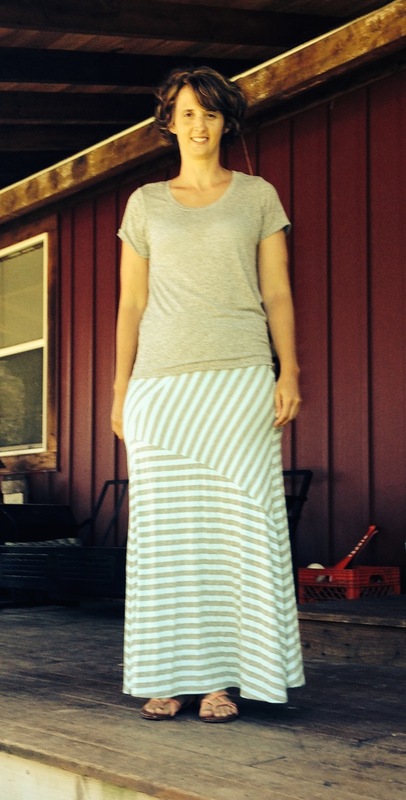 Here’s the Promesa Maxi paired with the gray Market & Spruce Hi-Lo tee. The shirt has a lower hemline in the back and the fabric is to die for… otherwise, a completely normal shirt. BUT. This box ended up being a home run- 5 for 5, and it would have been more expensive to return the shirt and pay full price for the other items than to keep it. Not a difficult choice on my end. Finally, I loved and kept the Under Skies Sweater Tank. The current space-dyed trend is not really my thing, but the tank is a dark navy and white and completely different than anything else in my closet without scaring me. It was a nice change. It’s also has a boho, crocheted feel to it… stretchy. Again, different and good. Have you tried it? Do you love it? 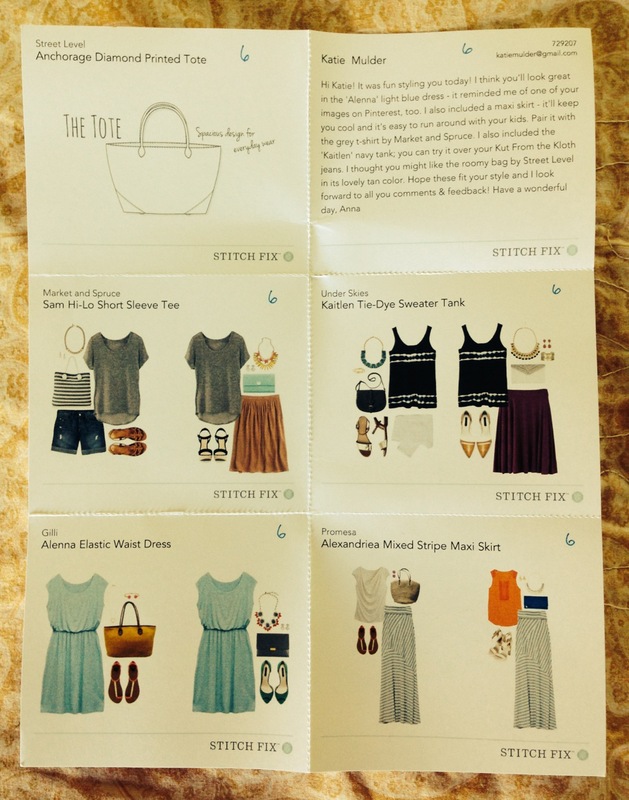 Shall we catch up on a little Stitch Fix action, friends? With my Lent-blog-fast and our eternal winter here in Michigan, I have received a couple more boxes but haven’t shown you the goods. Let’s do that and make the world right again. Remember how this works? You sign up HERE and fill out a survey on your sizes and preferences. They give you a delivery date and a beautiful box magically appears on your door with 5 items inside and a note from a stylist. Your account is charged $20 whether you keep anything or not. That $20 is credited towards any items you decide to buy, and you have 3 days to decide once your package arrives. If you purchase all 5 items, you get a 25% discount. Whatever you decide to return goes in a pre-paid, pre-addressed envelope- EASY. Basically, you risk $20 on this adventure. I’ve received 4 boxes and have kept at least one thing from each box. Everything always comes so nicely packaged. Such a treat. There’s tissue paper and envelopes and belts tied around clothing… makes this mamma’s heart so happy. Truly. When the navy 41Hawthorn Abriana Cardigan showed up, I was thrilled. It was exactly what I had asked for… a simple, lightweight wardrobe staple. I took the tags off immediately, threw it over the Tart tank from Stitch Fix #1, and headed to the bus stop. I also kept the Kut From The Kloth Guiliana jeans, which in the real world are Josephine jeans. Not sure why they change the model names on the jeans, but that’s been true in every box I’ve received. The Guiliana/Josephine jeans are a solid, dark navy wash. The Kensie Sweater was a no- too tight and not well-made for the price. The sweater itself was lightweight and wonderfully soft, but the faux-blouse pieces underneath kill it. Much more of a Target-type piece than a boutique piece. I did love the red blouse, but honestly, folks- there is something wrong with my arms. I have little tiny chicken arms, but all the shirts I’ve tried on in the past 4 years have been too tight around the upper arm. So weird. I blame my children. The LA Made Shirtdress was super cute and SUPER comfy, but a size too big on me up top. Ahem. For fix #3, I asked for another pair of KFTK jeans (since we had the sizing right and I love the fit) and a dress or two to choose from for spring. My happiest of days… when this Pomelo Sedona Shirtdress showed up in my life. 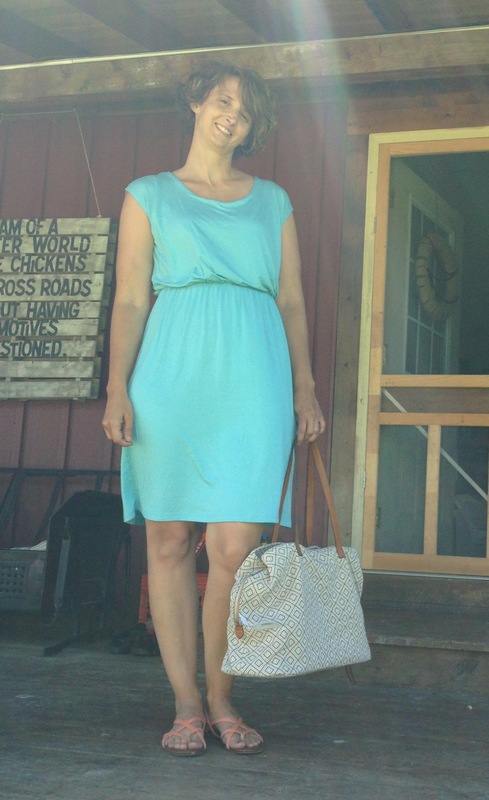 Lots of folks have had trouble with the fit on this dress/tunic, but the medium was perfect and loose on me. I wear it both over jeans and over tights. There is an attached belt that I tie in the back instead of the front, making it hang more like an artist shirt than a dress. I’m not exaggerating when I say I wear this twice a week. It’s quality weight fabric with a little shimmer to it. Love. LOVE. I’ve had a different stylist for every fix, but they are obviously reading my comments and taking not of my requests. I received and kept a regular pair of traditional-wash denim jeans (labeled Kut From The Kloth Simmons for Stitch Fix but Farrah on the actual jeans). I also kept the rayon Daniel Rainn Ishara Lace Detail Blouse. The color of this blouse is gorgeous- the ipHone is not doing it any favors. It’s also like nothing else I own, so it was a good addition to the slightly-more-dressy side of my small closet. The 41Hawthorn Sugar Dot Fit and Flare Dress was SUPER cute and Curt is still not speaking to me for sending it back, but it was just a tad too short for me to be comfortable. I wanted one more inch in the torso and a couple of inches on the hem. I think (LAWD), I THINK, I am past the age of wearing skirts that are above the knee. *sigh* I promised myself I would only buy things that I absolutely love and that fit me NOW. Therefore, no dress. The Pomelo Cutout Top was too wacky for me with the cutout in the back. I couldn’t do it. I tried, but I couldn’t do it. For Fix #4, I asked for a jersey skirts and maybe a jean jacket for the summer. Fix #4 arrived with a pair of Kut From the Kloth Lacie boyfriend jeans (which are actually the Catherine model) that I already owned (thanks to a killer sale on Amazon) so those were returned. 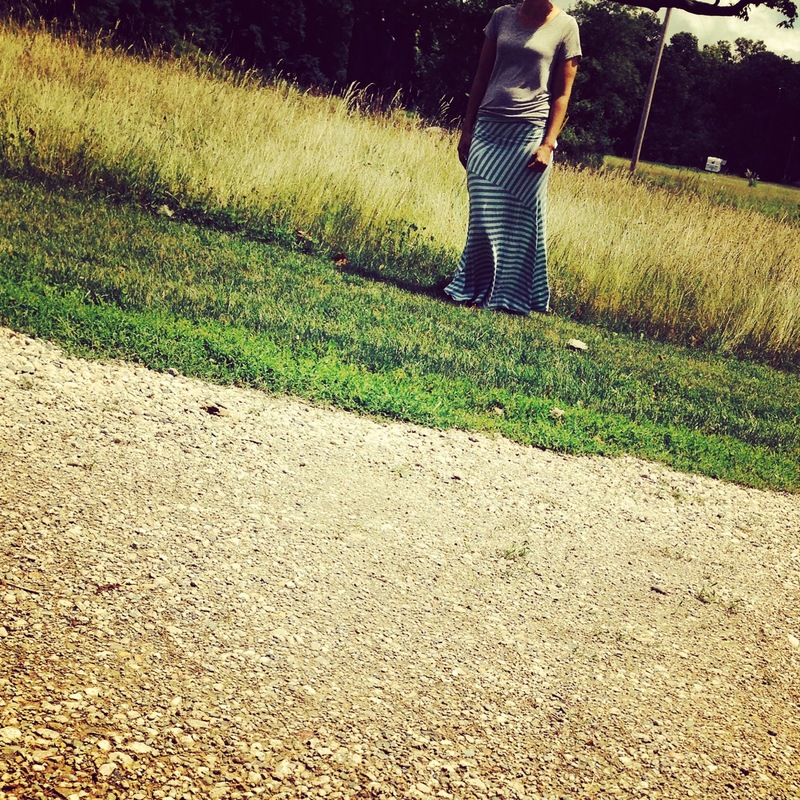 The maxi dress was cute and well-made, but just not my style. I wanted to keep the Pomelo Jersey Top because it is the softest thing I’ve ever felt in my life, but Curt was bugged by the cross-over detail in the front. I knew I wouldn’t wear it much if he wasn’t a big fan… though I considered keeping it to sleep with like a security blanket. I think it’s made of angel breath and clouds. (photo credit to Rylie who told me to “LOOK DOWN”) I kept the Lily Poppie Swing Skirt… it’s sooooo soft, beautifully lined, and the perfect length for me right now (points to Stitch Fix for totally reading my notes about wanting longer lengths). It’s also the exact navy of the 41Hawthorn Cardigan from Fix #2. I also kept the green sleeveless Collective Concepts Button-Up Blouse for the same reasons as the Rainn blouse from Fix #3… dressier than my usual but still within my comfort zone. No picture of me actually wearing that one and I don’t know why. Next time. For the next fix, I asked for a little more Bohemia and a little less Classic Prep. I love getting to try these clothes on at home- SUCH a luxury for me way out here in the sticks. I think I’ve got one more fix in me before I take a break for a couple months. I do love the surprise and the ease of “shopping” with them. I’ve added some very nice, very practical items to my drawers without stepping foot in a mall… and that basically make my year. If you’re on the fence, I think you should go for it. You should. Be specific about what you like and be really, really honest about your sizing. It’s a good time. Remember: while I’ve always opted for clothing ONLY, Stitch Fix also does accessories like jewelry and scarves and bags. Lots of choices! Los of fun! Soooooo, I jumped on the Stix Fix train. I did. The idea here is simple: you fill out an extensive survey covering your sizes, style preferences, and cost boundaries and they send you 5 items. It costs $20 per box, which covers shipping both ways and is labeled as a “styling fee.” Once you receive your box, you have 3 days to try your items on and decided what you like or don’t like. Keep what you want and send back the rest in the pre-paid mailing envelope they provide. Your $20 is credited towards any items you keep. TexasNorth is 35 miles from town and a good 45 minutes from Target or Old Navy. I do 95% of my shopping online, which saves me from driving to multiple stores and saves the stores from dealing with me and my children. Online shopping is a win-win for everyone involved. So, a pretty box mailed to me with clothes from brands I can’t get here in town? Try them on in my own home and match them with other items already in my closet? Absolutely. Sign me up. Stitch Fix was not a huge stretch for me in the risk category. I was pumped. The box was so lovely. All five of my pieces were wrapped neatly in tissue paper and tied with the belt from the Yumi dress. There was a card with an invoice and letter from my stylist, Alicia, as well as a small card for each item with styling examples. Very nice presentation. This Daniel Rainn blouse was a surprise love. The cap sleeves and straight cut fit perfectly. I was weirded out by the blue and black combination and just couldn’t get past it. This was Curt’s top pick, but I knew I wouldn’t wear it as much as it deserved. SENT BACK. This Tea N Rose cardigan was super fun, but too small. It was exactly what I was looking for: a basic cardigan that would wear through winter and into spring. The arms were super tight, which is weird… but simply a fit issue. I totally want the ballet flats in the example photo. SENT BACK. I wore this navy and red Yumi dress for 3 hours the day I received my package. Gideon immediately stole the belt and turned it into a tow rope for his construction trucks, but I couldn’t have used it anyway. I have a long torso and dresses with belt loops are always too short in the waist. The dress fit great without the belt. It took me three hours to decide that I just really needed one more inch in the waist for it to completely rock. Without the inch, it looked like I was trying to squeeze into a junior’s dress. It was a FABULOUS thick jersey, 100% lined… really, really nice. I put it on with my black biker boots and felt ready to go out on the town. This was SENT BACK with tears in my eyes. 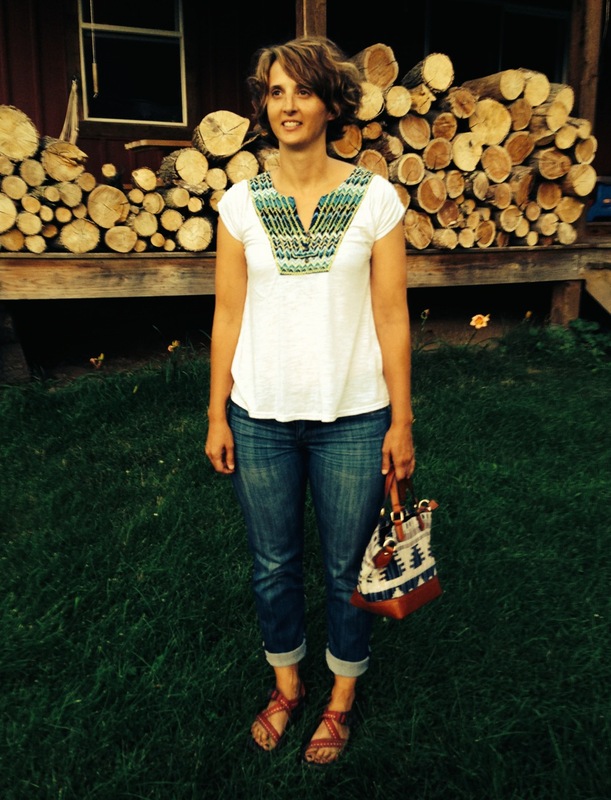 In my profile I requested some grownup jeans, and Alicia listened. She sent me a pair of KUT jeans, which I loved but they were at least a size too big and quite long. The card said “Katherine” jeans, but the tag attached to the jeans said “Natalie.” The “high rise” label was a bit deceiving… they fit lower than “mom jeans” and higher than “sketchy jeans.” Very nice weight, fabulous dark color, normal boot cut. Great jeans- but big. These were SENT BACK, but I requested them in the next box in a size down. 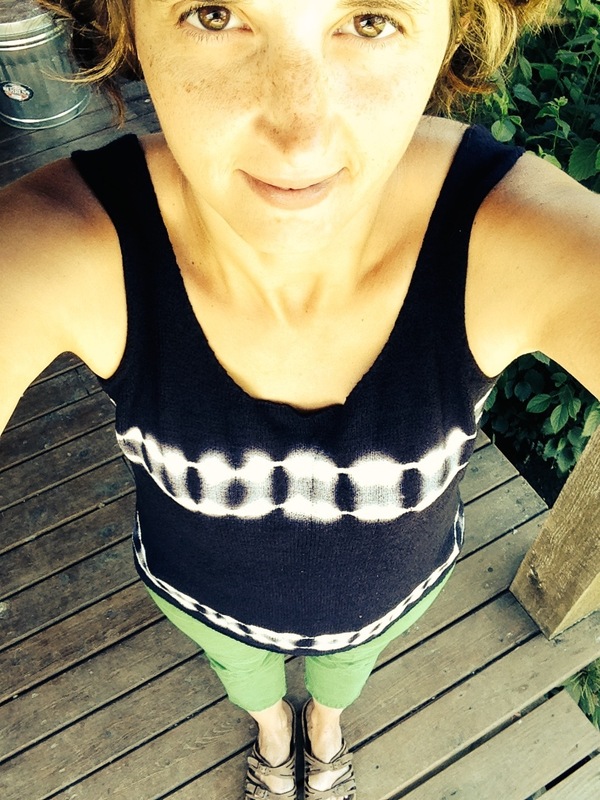 This olive and white Tart Remi Striped Tank was the item I kept. It’s perfect under a navy cardigan and more interesting than any other solid shirt I would normally choose. The fabric is super soft, fairly thin, and drapes well. Since I have no chest, I will have to tack down the crossover so we don’t have any wardrobe malfunctions, but otherwise it’s perfect. So, my $20 styling fee was credited toward this purchase. If I had returned everything, I would have forfeited the styling fee. If I had kept everything, I would have received 25% off the total. Loved the whole thing. Even if I had kept nothing the first time around, I would still be a fan. It was so fun to find the box on my porch and then try everything on at home in normal lighting with access to my own wardrobe at the same time. Great concept. Great service.